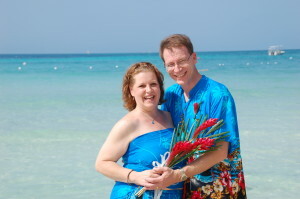 Our first trip to Jamaica and Couples Swept Away resort in Negril, Jamaica was back in 2007 to celebrate our 1oth wedding anniversary there on New Year’s Eve. I can’t believe it’s been that long and we are now coming up on our 20th anniversary next year. My stepson and soon to be daughter in law will go on their honeymoon here later this year. How exciting! We are putting an old site we had to rest so I’m moving our in depth review, trip diary, etc. over here. We went back a few times since our 10th anniversary and even participated in the Reggae Marathon half marathon. It’s been a while since we have been there but I’m sure the resort is even better today. You can read one of our other reviews of the Couples Swept Away resort. Below you’ll see a more in depth trip review from our stay there back on 12/27/06-1/3/07. The images throughout this post are from various stays at the resort. We arrived in Jamaica and headed to the Couples lounge. It was full of guests waiting to be whisked off to Couples. Met a few people from the Couples message board. We were offered drinks and waited for approx. 15 minutes for our bus to Couples Swept Away. Bus ride to the resort approx. 1½ hrs. We were handed cold washcloths and offered champagne. Beautiful open-air lobby and the Christmas decorations were still up. Check in process went very smooth, given keys to our room and bags were delivered to our room within 5 minutes. Got room that I had requested through our travel agent (heard great things about this room on the message board). Atrium room #1117 was more wonderful than we ever imagined. Beautiful porch/patio area with hammock and built in couch area, first floor, loved the fact we could walk right out the back door and be on our way. The bed is large and there are lots of pillows! Good size bathroom, large shower, very tiny bugs around sink area, walls, and floor and red ants on patio. Hey it’s the tropics, what do you expect? Shelved closet space-pretty good size: safe, iron, ironing board, extra pillows and a large umbrella inside. There was an air conditioning unit with remote control, screens/shutters on all windows, except there is glass on the windows in the room that faces the atrium. 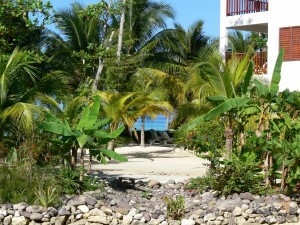 Partial view of the sea and love the sound of the waves crashing, we could hear it from our patio. We left items on the patio our entire stay and nothing was ever disturbed. The grounds are beautiful and kept up nicely. So many different palm trees, pretty flowers and plants. We were overwhelmed with the beauty of the resort. At one point we had a stopped up sink and it was fixed immediately. A 5 star experience from the minute we walked in the door to the time we left, each time. Service, food and ambiance at Feathers was outstanding. Our favorite restaurant! Christopher, on our 2nd visit to Feathers, remembered us from earlier in the evening when he saw us taking pictures of some of the local, lizard wildlife. He made a joke about it at dinner and we had a blast. He was very attentive. Today my thoughts are different, this turned out to no longer be my favorite restaurant because I prefer not to have to dress up and the meal time is too long for me. 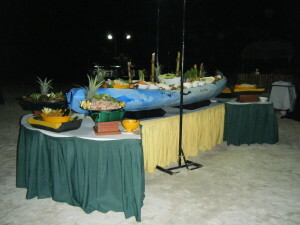 Enjoyed the breakfast and lunch buffets, wide variety of foods offered. Service was good but refills on drinks were a bit slow. We enjoyed having food choices and I would say this is our 2nd favorite restaurant. This restaurant is above The Palms. The food was really good. Our favorite part of this dinner was the Lemongrass Cooler, a non-alcoholic tea drink and dessert, the banana tempura and ice cream. You can also get the Lemongrass Cooler from the Martini Bar located just outside of Lemongrass. This is probably my top restaurant pick now although I really enjoy The Palms too. Decent service, not our favorite menu selections. Some of the food was overcooked but I did enjoy the soup. The side dish I received was not as listed on the menu and we weren’t told that it was going to be something different. No biggie! Teresa was a good waitress. Had breakfast here the morning after our dinner on the beach because Jelita, who was our server for our beach dinner told us she worked at Patios and to come see her for breakfast. Enjoyed the breakfast food and once again we give Jelita an A+ for service. Fantastic experience! (beware of the honeybees by the drink machines) We had the snapper and jerk chicken sandwiches. Enjoyed the appetizer for two (various foods like calamari, spring rolls, conch fritters, etc). Patricia was always very nice and helpful. We ate here quite a bit and enjoyed it every time. Our favorite bars for non-alcoholic drinks were the swim up pool bar, where Duke made us the most awesome blended fruit punch smoothie and at the Aura Lounge bar. Great service and tasty drinks. A few people on the Couples message board ask if the Couples Swept Away all-inclusive resort is worth it if you don’t drink and we are here to say that in our opinion it is most definitely worth it to us. Tamika was our coordinator and since June had been a great resource and help in planning our special day up until we arrived at CSA. We met with her a few days before our renewal to finalize everything from the flowers, to the cake and beverages, etc. She was extremely helpful. The ceremony itself was beautiful and the setting of the wedding arch on the beach was spectacular. The reception table was set up nicely in a shaded garden area of the resort and we enjoyed ourselves. Shane, the photographer was very attentive and fun. We purchased a wedding album photo package and were very impressed with the whole process. Breathtaking experience! Jelita was a great server, very attentive, creative and fun. 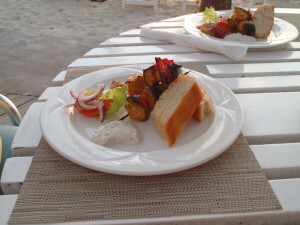 We were served a five-course meal that was very flavorful and the presentation was superb. Hats off to the main kitchen chefs on this dinner. 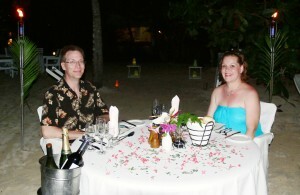 Very romantic and peaceful with the sound of the waves crashing in front of us under our torch lit table in the sand. Just young kids back then! Purchased the Forever Yours romance package, excellent deal that included dinner on the beach, flowers, non-alcoholic champagne (our special request) and gift certificates for the spa and gift shops. We were very happy with our purchase of this package. Had the Couples massage and we also took advantage of the Sea Spa Manicure & Pedicure package special they were offering. 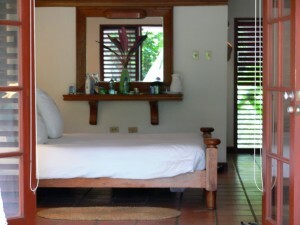 Both services were very relaxing, easy to make appointments and the staff was very friendly. Had a few fruit drinks from the bar there and they were good. Did not exercise as I had planned however they do offer a wide variety of workouts and equipment. One day, we had to take a quick trip to the nurse’s station at the Sports Complex because hubby had a terrible headache (yes, I forgot to pack Tylenol oops) and I had some major bug bites that turned into huge red welts on my legs (learned I have allergic reactions to sand fleas/noseeums). She gave Kev some meds and had me put on some hydrocortisone. The nurse was great. Had a lot of fun snorkeling, we went 3 times during our stay (if you have your own mask & snorkel there is a better chance to get on the list if it’s already full). Trillan was always fun and attentive. He made me feel very comfortable every time we snorkeled. On our 2nd snorkel trip, I thought I could snorkel without the life vest but I was mistaken and he was on the ball and had the vest ready to throw out to us. Impressive! Went on the glass bottom boat tour and saw starfish, turtles, parrot fish, stingrays, coral, a sunken catamaran, etc. Again, Trillan was a super guide and really knew his stuff. Took one of the Water Bee’s from the Water Sports hut out on the water and it was fun, a two-seater, pedal boat. 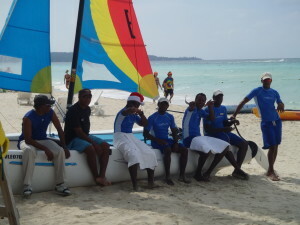 Went on the catamaran cruise, very lively, we opted not to dive off the cliff but we did snorkel while we were there. Hubby enjoyed the slide too. Total cat cruise time was about 2 hours. Nice view of the coastline and a relaxing ride. We had a blast with Andre “Chubby” learning new phrases and more about the Patios dialect. Lady Barbie and Big D taught us about Jamaican cooking with a chef who did an awesome job. Tasted Ackee & Saltfish, tried a Ginger Rootbeer and Ting. Neither class was too long and we enjoyed them both. The staff left a small bottle of champagne, two glasses and a nice card in our room to wish us a happy holiday season. Cocktail party had to be moved indoors because of rain and kudos to the staff for making that transition in record time. It was moved to a conference room in the Great House, next to the Aura lounge. There were plenty of hours d’oeuvres and alcoholic beverages. It was however not a party conducive to non-drinkers as there was nothing available for us, not even water. We totally understood that it was a cocktail party but I was just a tad disappointed that water was not even available. No problem though, we just got something to drink when we went to the Palms for dinner. We were given a top hat, tiara and noisemakers upon arrival at The Palms. Plenty of great food and drinks available too. 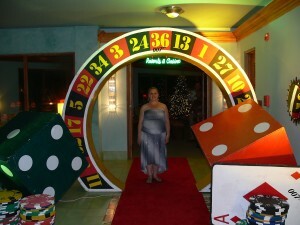 The theme for New Year’s Eve was Casino Royale 007. Excellent set up, beautiful decorations and a rockin’ dance floor with tons of balloons and confetti dropping at midnight. There were a variety of musical talents too. We rang in the New Year at Couples Swept Away, what could be better than that? Danced the night away at the Palms and then we went over to the disco and Aura lounge. Stayed out until 2:30 AM dancing and had a blast. Only used the pool once but all of them looked inviting, we chose to get in the pool with the swim up bar and relaxed by the waterfall. One of the hot tubs by the swim up bar was way too hot for us and the hot tub by the Palms was not working but we really enjoyed the hot tub in the middle of the resort complex. Went in that one a few times and always had it to ourselves. Not too crowded, sand was very soft and well maintained. The CSA ‘beachcombers’ would be up early every morning raking the sand and picking up trash/seaweed that may have been on the beach. They also organized the chairs and cushions/floaties in the evenings as well. The day we arrived and the following day, the island’s Internet provider was experiencing problems and we were not able to access the Internet. The staff was aware of the problem and kept us informed. The remaining 6 days of our stay we were able to access email to check in at home and there were always computers available. The staff at Couples Swept Away was amazing. We were treated like a special guest throughout our entire stay. We would like to give a big thanks to Tamika, Jelita, Trillan, Andre “Chubby”, Duke and Christopher who all made our vacation very special. Every staff member we came in contact with every day was so warm and welcoming. Kudos! Beautiful weather, warm, sunny, some clouds. On Dec. 30th the weather was sunny and just plain perfect for our vow renewal. Had unusual, quick rainstorms most days around 2:30 PM, New Year’s Eve it rained quite a bit during the afternoon and early evening. Overall, great weather for our entire trip. A rainy day in Jamaica is better than any winter day in Chicago. What a sad feeling! We did not want to leave this place we call Paradise. Received our departure info and a comment card a few days before that said we had to have our luggage out of the room by 11 AM on day of departure. We checked out of the room but still had a few hours until the 2 PM bus ride back to the airport. They kept our luggage at the lobby area and we were able to access it if we needed to. Checkout process was a breeze. We were home for almost 5 days and had not even thought about turning on the TV! That says something huh? 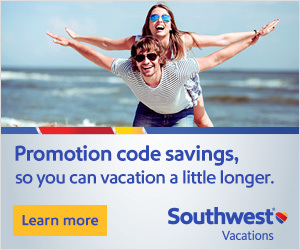 But we never watch TV while on vacation anyway! We had THE most fabulous vacation at Couples Swept Away. We now live by the Jamaican motto, “No problems, only situations”. Like I mentioned, we returned a few times since this trip and would definitely recommend this resort. 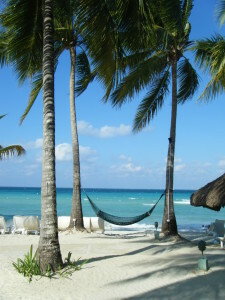 Have you ever been to a Couples Resorts property?